A Command Transformation script can be used to change command properties at runtime. It's only safe to modify agent commands in Command Transformation scripts and Agent Initialization scripts. It's not safe to modify sub-commands in a Command Transformation script. You should only modify the current command. 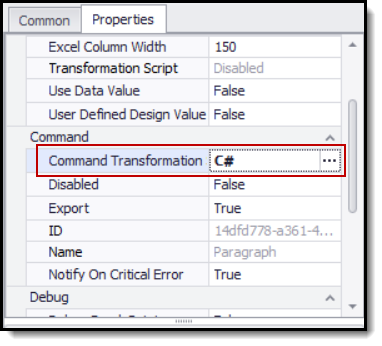 Command Transformation is available from the command Properties tab. The script must have a static method with the following signature. The function must return true for success and false for failure. A script utility class with helper methods. See Script Utilities for more information. The current agent command being executed. You can change the properties of this command, but not on any sub-commands. The parent container command of the current command. The current internal database connection used by the agent. This connection is already open and should not be closed by your script. The current internal data row containing the data that has been extracted so far in the current container command. True if the agent is running in debug mode. If true, only the data schema is required, so you can optimize processing by only returning the data schema with no data. All input data available to the current command. Writes log information to the agent log. This method has no effect if agent logging is disabled, or if called during design time. Triggers notification at the end of an agent run. If alwaysNotify is set to false, this method only triggers a notification if the agent has been configured to send notifications on critical errors. Triggers notification at the end of an agent run, and adds the message to the notification email. If alwaysNotify is set to false, this method only triggers a notification if the agent has been configured to send notifications on critical errors. Global data dictionary that can be used to store data that needs to be available in all scripts and after agent restarts. Input Parameters are also stored in this dictionary. Returns the specified database connection. The database connection must have been previously defined for the agent or be a shared connection for all agents on the computer. Your script is responsible for opening and closing the connection by calling the OpenDatabase and CloseDatabase methods. If the current command is a data provider, the data for that command is returned. Otherwise this function searches the command's parents and returns the first found input data. If the specified command is a data provider, the data for that command is returned. Otherwise this function searches the command's parents and returns the first found input data. If the specified command is a data provider, the data for that command is returned. Otherwise the function throws an error.